Shoulder pain is a relatively common complaint for people who have a poor workstation design. The reason for this is the position/posture that the shoulder is often placed in when your workstation ergonomics are less than optimal. A slouched or slumped posture is the most common cause of shoulder pain in the office-worker. Such a posture is characterised by a rounding of the shoulders, and can be seen in the picture to the right. The reason this posture often leads to shoulder pain is because of the changes that occur to the muscles around the shoulder as a result. It should be noted that sitting in a slumped posture for short periods isn't likely to cause shoulder pain. However, the majority of people who sit in a slumped posture do so for prolonged periods, and this is a problem. When the shoulders are rounded into a slumped posture, you effectively shorten and tighten your chest muscles, and lengthen and weaken your back muscles, particularly the muscles that support the shoulder blade. Over time, this can lead to muscular imbalances, which in turn leads to altered mechanics of the shoulder. Pain is often the end result. Furthermore, when you sit with rounded shoulders, the muscles that run from your shoulder blades to your neck and skull are constantly being stretched. These muscles are particularly sensitive because of their close proximity to the neck and the nerves that leave the neck. As such, this constant stretching leads to pain in itself, as well as causing these muscles to go into spasm. As a side effect of these muscles going into spasm, there is also the potential for these muscles to irritate the nerves that run through this area. As you can see, there is quite a bit going on in and around the shoulder region. It is a very sensitive area at the best of times. This is why shoulder pain is so common in office workers. 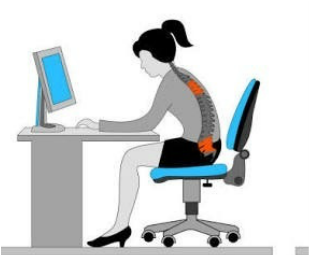 The best way to avoid shoulder pain from a slumped postures is to ensure your chair and computer screen are set up correctly, and that your feet are well supported, either on the floor or on a footrest. Together, these three things help to push you back into the backrest of the chair, thereby preventing you from adopting a slumped or slouched posture. If the mouse or keyboard is too far away from your body, then the same things happen to the shoulder as occurs when your shoulders are rounded (see above). With that said, it doesn't tend to be as big a problem as a slumped posture. Nevertheless, it is still a problem and is often overlooked when trying to work out why an office-worker has shoulder pain. When the arms are positioned out in front of the body, which happens if the keyboard or mouse is too far away, the chest muscles are shortened and tightened, and the back muscles are lengthened and weakened. As described above, this leads to muscular imbalances, as well as causing muscle spasm to the muscles that run from your shoulder blades to your neck/skull region. This is where the pain comes from. It is worth noting that if your shoulder pain is isolated to the side that you use your mouse, it is highly probable that the mouse is too far away from your body, and that this is a key cause of your pain. So, how far is too far? Often there is no one-size-fits-all approach here. However, having the keyboard and mouse within 8 - 12cm from the edge of the desk is usually an appropriate distance for most people. If you have tried bringing your keyboard and mouse closer, and your shoulder pain is still bothering you, you would benefit from an ergonomic assessment, as there may be other contributing factors that you are unable to detect yourself.